Phlebitis is the name given to an inflammation of the veins, usually in the legs. It is almost always a complication of varicose veins. Thus “phlebitis” simply means inflammation in the veins. However, veins virtually never become inflamed without any reason at all. The commonest cause of phlebitis that occurs naturally is when a clot forms in a vein near the surface and the vein becomes inflamed, which is the natural reaction of a vein to a clot within it and the way clots are removed naturally. We will now return to the most common type of phlebitis – phlebitis that is associated with varicose veins or hidden varicose veins (caused by venous incompetence or venous reflux disease). Firstly, we need to understand why the clot occurs in varicose veins or hidden varicose veins. In normal leg veins, blood flows up the veins when pumped by the foot or leg muscles on exercise. When the leg is not exercising, the blood starts to fall down the leg and is stopped by valves. In people with varicose veins or hidden varicose veins (caused by venous incompetence or venous reflux disease) these valves have stopped working. In this case, blood is still pumped up the veins normally on movement. However, when the leg relaxes, the valves are not functioning and so blood falls down the leg veins due to gravity. The valves are said to be “incompetent” and the blood is “refluxing” back down the leg veins in the opposite direction to normal. This abnormal backward flow of blood increases the amount of blood in the leg veins and, once this reflux has been going on for several years, some of the vein walls weaken and start dilating. 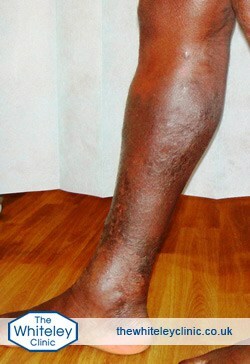 If these dilated veins are seen on the surface, they are called “varicose veins”. However, if they are too deep to be seen on the surface, they will not be visible. But they are there and dilated and so act just like any visible varicose veins. Historically there has been no name given to these veins. We now call them “hidden varicose veins” for obvious reasons and, whenever we talk about hidden varicose veins, we know they are caused by venous incompetence (the valves not working) and venous reflux disease (the blood falling the wrong way down the veins with gravity). In varicose veins and hidden varicose veins, both the vessel wall has changed due to dilatation and also flow has changed as the blood is now refluxing rather than being stopped by normal valves. As such, in certain circumstances, blood can clot within these varicose veins or hidden varicose veins. When blood clots within a vein, it is called a “thrombosis”. When a thrombosis occurs within a vein, it irritates the wall, setting into action a chain of events resulting in inflammation of the vein wall and surrounding tissue. This inflammation is nature’s way of trying to heal the clot or thrombosis. Inflammation increases the local blood supply and brings white blood cells to the area, which will eat away the clot over time. However in some patients, before this can happen, the clot can extend which can cause major problems. If the clot extends into the deep veins, it can become a deep vein thrombosis (DVT). In addition, if that clot flies off in the venous blood flow, it can go through the heart and into the lungs a very serious condition called pulmonary embolism (PE). Until recently, it was thought that phlebitis could not cause any major medical problems and so treatment was quite simple – aspirin and compression stockings. However recent studies have shown that it is essential to get an urgent duplex ultrasound scan and on the results of this, anticoagulation treatment may be needed to stop deep-vein thrombosis (DVT) and pulmonary embolism (PE). It is very important to note at this point that the inflammation is due to thrombosis (clot) within the vein and NOT any infection. As we will see later, doctors and nurses who do not understand phlebitis will often prescribe antibiotics purely and simply because the vein is hot, tender and red. These are the signs of inflammation, which, in phlebitis, is due to healing and NOT infection. Therefore antibiotics will have absolutely no effect on phlebitis. Phlebitis is commonly misdiagnosed and more importantly it is very often mistreated. It has now been shown, by studies in America and the UK, that Phlebitis in the veins in the legs can give rise to clots that travel to the lungs. These clots are called Pulmonary Emboli (PE’s) and they can be life threatening. Most patients with Phlebitis are not at risk of PE’s. However without a duplex scan, it is impossible to tell which patients with Phlebitis are at risk and which patients are not. 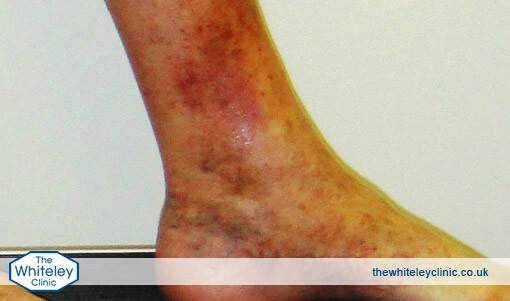 Hot, red, lumpy veins in the legs – are due to blood clots in the veins just under the surface. These clots cause the vein and surrounding tissues to become inflamed. There is no infection so antibiotics have no effect at all and should not be given. The correct treatment depends on how much risk there is of a Pulmonary Embolism (PE) developing. This is assessed by a duplex ultrasound scan, performed by specialists who treat veins all of the time. It is essential that if a diagnosis of Phlebitis of the legs is made, a duplex ultrasound scan is arranged as soon as possible to make sure that the correct treatment is started. In addition, the same duplex ultrasound scan will be able to diagnose the underlying cause of the Phlebitis, usually varicose veins or hidden varicose veins. Based around the results, a treatment plan can be put together to prevent the Phlebitis occurring again.